This event will be held rain or shine!!! The 1st place male runner and the 1st place female runner in the 5k will win a $100 cash prize. Every particpant will receive a T-shirt and a medal. We included a 1k family walk/run to invite the entire family to our event. 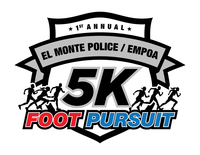 The Foot Pursuit Run continues to grow every year. We lowered the price for children to invite everyone to have fun and encourge them to walk/run. Start time 8:00 am SHARP! !